The most basic system. 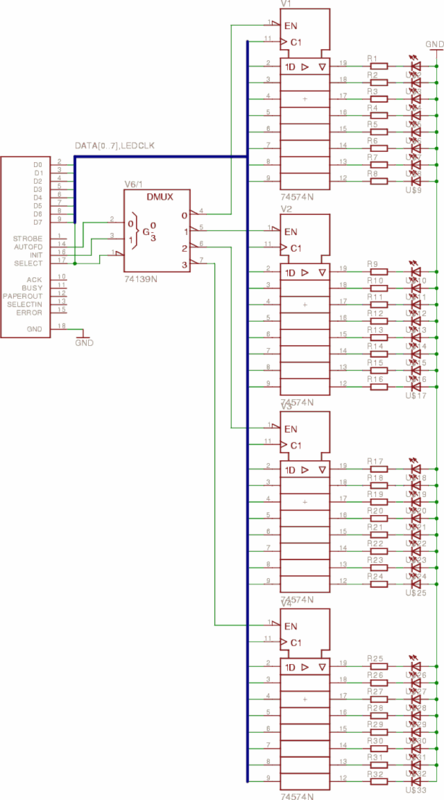 Simply connect 8 Leds to D0-D7 on the parallel port. Don't forget a resistor of about 200 Ohms! As the parport has 12 output pins, I recommend you build this version. The leds should are aligned the pins on the 25pin D-Sub connector. Some parports seem to source the control pins 1, ... less than the data pins, so you may need 200 Ohm resistors for D0-D7 and some smaller resistors for the control pins. This is the complete luxory version. You will need help of 5 TTL chips from the 74xx line.